Seattle-based Urbanspoon is a restaurant website and popular iPhone app that’s been shaking things up in the world of on-line reservations — and downloaded from the Apple App store 9 million times. 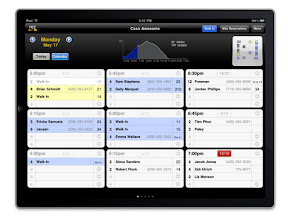 On Thursday, the company announced the launch of RezBook, an iPad application that takes the concept of an old-fashioned restaurant reservation-book and turns it into a slim, smart, high-tech table-management tool. Having dealt with the Luddite version during my waitressing career (anybody got a pencil? 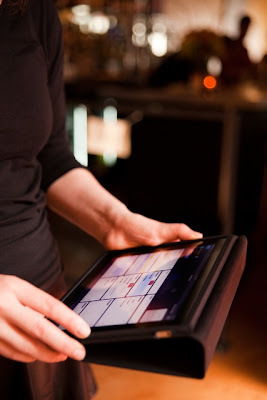 ), and seen the RezBook pilot-program in action last week at the new Madison Valley bistro, Luc, I think it’s destined to become the hot new thing in restaurants nationwide. Apparently, I’m not alone. 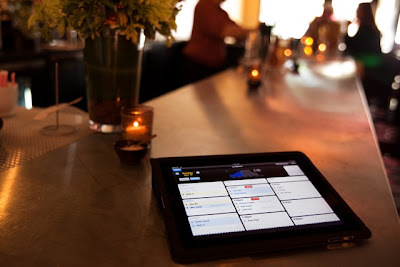 Urbanspoon got the full-court press this week, with the Wall Street Journal calling the company’s iPad-based service “a nascent but serious threat to OpenTable’s dominance of the online reservations market (full story here). And RezBook wagged the tails of tech-talkers here, there and everywhere. Urbanspoon’s new RezBook application as seen on an iPad, resting in an iPad cover on the zinc bar at Luc — one of only five restaurants presently operating the system. [photo: Lara Ferroni]. Company co-founder Ethan Lowry told the New York Times his new product is meant to bridge the gap between a paper book and his competition’s electronic version. “The iPad itself is off-the-shelf and inexpensive, versus having to make a big investment in proprietary and expensive hardware,” he said, in an obvious reference to OpenTable.com — the grand dame of on-line reservation services that captured my fancy back in 2005. RezBook is meant to complement Rez, Urbanspoon’s real-time on-line reservations system, unveiled last fall. And it’s apparently a hit for the 100-plus restaurants now using it in and around Seattle, according to this video testimonial. Some Rez-taurateurs view it not as a competitor to OpenTable, but as a complement to that service. Urbanspoon Rez Customers from Urbanspoon on Vimeo. Chefs, busy in the kitchen by day while fielding phone calls for reservations, can keep their RezBook close at hand, and will appreciate not having to run to a computer-operated reservations system elsewhere in the restaurant. Ditto for managers and restaurateurs who might be working in a back office — or remotely. 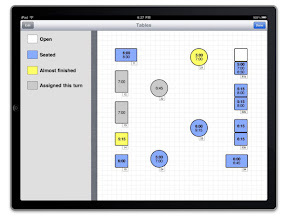 Harried hostesses will like the ability to drag-and-drop tables to reformulate their dining room set-up before — and during — service, to accommodate changes. So, what happens if the iPad battery dies unexpectedly, the thing gets locked in a drawer somewhere or accidentally thrown in with the dirty laundry and carted away? “The immediate solution is you can go onto the Web” and access your private account via a computer, Lowry said. The five restaurants currently using the test program — Luc, Monsoon, Matt’s in the Market, Harvest Vine and Joule — are paying only for the Rez service ($19.95 per month), but will soon join newcomers paying a $99 monthly subscription fee plus $1 per seat booked through Urbanspoon (Rez-ervations booked through the restaurants’ own website are free). When Joule opened on a shoestring in 2008, the couple considered signing on with OpenTable, Chirchi said, but decided against it. “It was a space issue and a cost issue. It cost about $5000 to install the monitor and computer system, and we didn’t have room for it.” Paying $500 for a new iPad was easier to swallow. 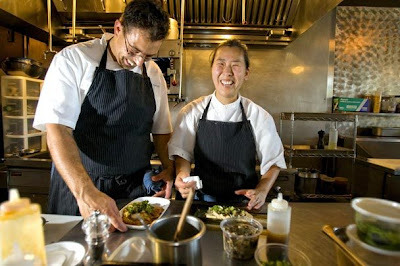 Seif Chirchi and Rachel Yang work in close quarters at Joule [Seattle Times photo: Mike Seigel]. That ease of operation, he said, extends to his customers, who may now make reservations via Rez that immediately pop up on his iPad, either directly through Joule’s website (capturing about 80 percent of his on-line reservations), or through Urbanspoon (which refers the other 20 percent). “I think it’s increased our business. People want the ease of making a reservation on-line, and like the ability to do it on their own computers. Try it! You’ll see!” Chirchi urged. So I did. The process took less than a minute. In the coming months, Lowry and his business-partner Patrick O’Donnell, whose company was bought last year by the New York internet giant IAC, plan to “widen their net” — adding new RezBook subscribers beginning in June. And they expect many of those early adopters to be restaurants right here in Seattle.